The certificate for this server is invalid. You might be connecting to a server that is pretending to be “Domain name” which could put your confidential information at risk. and just enable the Full Trust for your root certificate. But what about return values? For as you know, WKWebView runs in its own process and that’s why pushMessage() function cannot return any value. It is not possible to get the return value from native function synchronously. It is also not possible to give a JS callback function to native function. So what to do, if we need a return value from native function? In apps that run in iOS 8 and later, use the WKWebView class instead of using UIWebView. 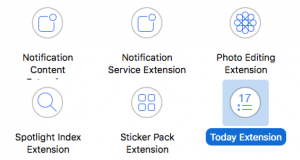 A Today extension, also known as a widget, is a way for the app to provide quick access to its main functions and the up-to-date information in the Notification Center. The content for the widgets might be directly fetched from the web, but quite often there is a requirement to share data between the App and its widget. How to add Today extension / Widget to an existing project? Just add a new target of type “Today extension” to your project . To debug/start Today extension just select the proper target and run. Can the same code, e.g. views and controllers, be shared/utilized between Widget and App targets? Yes. Be sure to select checkboxes for the corresponding files in the “Target Membership” window of the Xcode. There are, however, some limitations, especially using swipe gestures. The swipe gesture triggers swiping between the Today and Notifications sections within Notification Center, so it doesn’t really provide the best or most reliable user experience. What about CoreData in Widgets? No problem, almost.. In general, by default, an App and its extension cannot access the same data, since their security domains are different. In order to solve this problem there should be created an App Group. An App Group provides a shared bundle that can be used by the app and its extensions as a shared container in which data can be stored. The App group can be configured in the apple developer portal (s. nice tutorial) or directly in Xcode under target capabilities. Detecting incoming and outgoing calls in Android can be realized in several ways. One of the possibilities is to use a custom PhoneStateListener which can be attached to the TelephonyManager in your onReceive() function of the custom BroadcastReceiver. This is a “clean” way, beacause the BoradcastReceiver object is destroyed as soon as the onReceive() function is left. But if you just want to do some little stuff, you can implement your logic directly in the onReceive() function. Here how it works. For detecting outgoing calls you need to register android.permission.PROCESS_OUTGOING_CALLS permission. The android.intent.action.NEW_OUTGOING_CALL will be broadcasted when an outgoing call is initiated. Use an extra string variable Intent.EXTRA_PHONE_NUMBER to detect the outgoing number. For incoming call you need to register your BroadcastReceiver for the action android.intent.action.PHONE_STATE. This will be broadcasted when the phone state is changed. The receiving intent contains an extra string variable TelephonyManager.EXTRA_STATE. If this state is TelephonyManager.EXTRA_STATE_RINGING then there will be another extra string variable (! only if state = TelephonyManager.EXTRA_STATE_RINGING !). Use TelephonyManager.EXTRA_INCOMING_NUMBER to read the incoming phone number. For as you know, Delphi does not really have a standard dialog for choosing a particular folder, like OpenFolderDialog. The function below uses ShellAPI and implements exactly the desired behaviour. 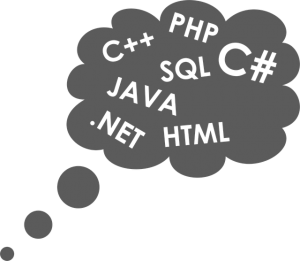 The topic of current post is a special class of high level languages that execute dynamic programm code not known to a compile time. The key advantage of such languages is that a program and its parts written once can be later modified without recompiling the code! When can this bahaviour be useful? Dynamic languages are widely used in web development and in games development. When a clear seperation of the fuctionality and content management is required, dynamic lanugages are of great help. For example you wrote a game and it’s obviously that it would be more better to handle the multilingual dialogs and other text in your game in such a way, that when you make changes to the content you don’t need to recompile your game. Let’s start with PHP. It is currently one of the most popular languages in the web development sphere. PHP interpreter is typically installed as a module into a webserver like Apache and executes scripts written by programmers. There is also a standalone version of PHP, that supports GUI development. Familiar evolution process is revealed by Perl. There also exist implementations as a module and as a standalone application. Perl was first time released in 1987. It partly borrows syntax and language constructions from a set of languages like C, shell (sh), AWK and Lisp. Looking once for a dynamic language for PDAs I came across Tcl with graphical user interface toolkit Tk. The advantage of TCl/Tk is its platform independence. A program implemented in TCL/TC can be interpreted and executed on the most popular platforms like Linux, Macintosh, Windows, Windows CE etc. The only differece is look and feel of user interface components. The early versions of TCL didn”t support OOP but nowadays there are implementations supportig the advantages of OO concept. Another dynamic language I’d like to introduce is Python. It’s a stable and a very popular multi-paradigm programming language. Python is used in such large projects as Youtube, Zope etc. Besides Python standalone version there exists java implementation of Python called Jython and .NET integration of Python called IronPython. In these implementations one can execute pythons scripts within java or .Net programs. Unfortunately, I found out that IronPython doesn’t work in Compact Framework because annotations aren’t fully supported in CF and IronPython rely on these libraries very strong. A good alternative to Python is Lua. There are also implementations of this interpreter for many popular platforms. Lua integration with Java is called LuaJava and the .NET version is called Lua.NET. Lua”s interpreter is very small and very quickly. Lua is often used for games creation. The most popular games implemented in Lua are: World of Warcraft, Monkey Island 4, Parkan 2 etc. Unfortunately, the documentation for Lua leaves much to be desired. For more information on dynamic programming languages please refer to wiki article Dynamic Programming Languages. For more information on scripting languages supported in Java visit this page.